How do you know what size bracelet to buy? When shopping for bracelets, the process is easier when you know exactly what size to buy. Please continue reading for a step by step guide on how to measure your wrist. Use a tape measure. 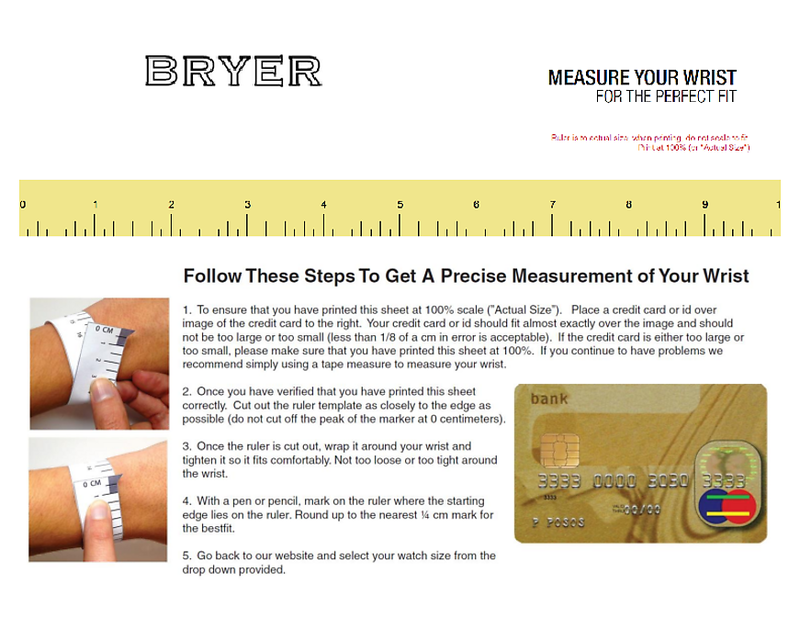 Wrap the tape measure around the wrist on which you plan to wear your Bryer bracelet. Make a note of the number at the point where the tape meets the 0. To ensure the bracelet fits comfortably, add one fourth of an inch. You can then add or subtract as much as you need according to whether you prefer a loose, exact or tight fit. Download and Print the Bryer Leather Wrist Sizer. Before printing, make sure the “page scaling” option is set to “None” in the dialog box of your printer options. The Bryer Leather Wrist Sizer must be printed on full-size standard letter paper. Follow the instructions and make a note of your wrist size.